We’d love your help. Let us know what’s wrong with this preview of Radar, Hula Hoops and Playful Pigs by Joe Schwarcz. Have you ever wondered about the science behind Alice’s strange adventures in Wonderland, Casanova’s experiments with "Spanish Fly," and zombies in Haiti? 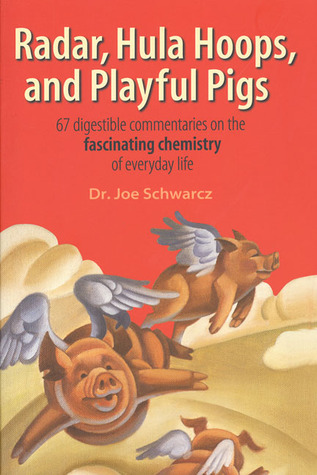 In Radar, Hula Hoops, and Playful Pigs, chemist and columnist Dr. Joe Schwarcz offers 67 entertaining essays exploring these and other delightful nooks and crannies of chemistry. Investigate the nefarious chemistry of the Have you ever wondered about the science behind Alice’s strange adventures in Wonderland, Casanova’s experiments with "Spanish Fly," and zombies in Haiti? In Radar, Hula Hoops, and Playful Pigs, chemist and columnist Dr. Joe Schwarcz offers 67 entertaining essays exploring these and other delightful nooks and crannies of chemistry. Investigate the nefarious chemistry of the KGB, the colors of urine, and the mysteries of baldness. Learn how shampoos really work, and discover which cleaning agents must never be combined. Get rid of that skunk smell in a jiffy, and get a whiff of what’s behind the act of passing gas. Read about the ups and downs of underwear, the invention of gunpowder, Van Gogh’s brain, John Dillinger’s chemical exploits, and Dinshah Ghadiali’s bizarre attempts to cure disease with colored lights. Finally, discover the amazing links between radar, hula hoops, and playful pigs! Written by popular media personality Dr. Joe Schwarcz, this 1999 Canadian best-seller is proof positive that a little intellectual dip into the vast ocean of chemistry can not only be useful but pleasurable as well. To ask other readers questions about Radar, Hula Hoops and Playful Pigs, please sign up. I give this book an 4 out of 5. I found some of stories extremely interesting and others very hard to get through. I will say that I liked that you did not have to read every single story to understand the book as they really do not connect to each other. I, personally, skipped around and read the ones that seemed most interesting to me. A big reason this book is not a 5 out of 5 was because some of the short stories seemed to drag on. The author included a somewhat dense history to quite a few I give this book an 4 out of 5. I found some of stories extremely interesting and others very hard to get through. I will say that I liked that you did not have to read every single story to understand the book as they really do not connect to each other. I, personally, skipped around and read the ones that seemed most interesting to me. A big reason this book is not a 5 out of 5 was because some of the short stories seemed to drag on. The author included a somewhat dense history to quite a few of the stories forcing me to either skip over the boring parts and find a new section or to power through it and end up being pretty disinterested. I will say that the author did a great job about making chemistry- a subject most would think of as pretty tedious and boring - pretty interesting and connecting it to things that I would not have even thought of to have a chemistry background. This book has left me with a plethora of knowledge, some useful, some not. I learned a lot of new information from this book, though! I would recommend this book to someone who has somewhat of a background knowledge on chemistry as it would be helpful but also think that someone without prior knowledge on chemistry would enjoy this book as well. A collection of explanations/talks about chemistry (and other stuff) and applications to life in general. A little dated now, an update would be great. Also, not many dates and no footnotes or endnotes which would have been helpful. Great book. You don't need to have any chemical knowledge. It's for all kind of people. The book shows really facinating comments about chemistry, does worth to read! After reading this book, I would give it a rating of 4.5 out of a possible 5 stars. I gave it this rating due to the fact that my overall feeling while and after reading this book was pretty positive. The book looked at the chemistry of everyday items and went into explanation about how they worked. Also, the book picked topics that were interesting and would keep the reader interested during every short story, along with having a story for everyone. (Such as; Science behind Alice in Wonderland, After reading this book, I would give it a rating of 4.5 out of a possible 5 stars. I gave it this rating due to the fact that my overall feeling while and after reading this book was pretty positive. The book looked at the chemistry of everyday items and went into explanation about how they worked. Also, the book picked topics that were interesting and would keep the reader interested during every short story, along with having a story for everyone. (Such as; Science behind Alice in Wonderland, Zombies in Haiti, explanation behind passing gas, etc.) But what I really appreciated about this book is that it did not chose to drone on and on about just the chemistry knowledge about every item, chemical, or material that Dr. Joe Schwarcz chose to evaluate, instead he told stories to make the book more interesting. One example of this that I enjoyed particularly was when the book talked about John Dillinger, a well known criminal, they told of a rumor of how he had escaped from prison while incorporating in how it was chemically possible using iodine and a potato. This could have been a textbook or another dry informational piece of writing however, by adding in stories and things the reader can easily connect to really helps it become a fun and easy read. I only gave it 4.5 though because I felt in some cases the same materials became repeated in spots, such as polyethylene and “Celluloid” were examined more than once throughout the book. Although these are very important materials it was kind of monotonous to try and read. At times during this novel I also felt that it was kind of a long book to read due to it being 281 pages, and it requiring you to think while you read. Overall I really enjoyed this book more than I expected to, it was an enjoyable read and a new way to look at chemistry in things I had never really paid attention to in my everyday life. Desde que eu era pequena, a química me fascina. Eu acreditava que misturar xampus e condicionadores no banheiro era algo mágico e passei muitas tardes com meu irmão aprontando dessas travessuras. Um dos meus maiores traumas é não ter tido um kit alquimia quando era criança. Todo esse amor me fez escolher Química como curso na faculdade e os livros que descrevem a química no dia-a-dia são os meus favoritos, ganhando de todos os romances históricos que podem aparecer por aí. Assim, não é de surpre Desde que eu era pequena, a química me fascina. Eu acreditava que misturar xampus e condicionadores no banheiro era algo mágico e passei muitas tardes com meu irmão aprontando dessas travessuras. Um dos meus maiores traumas é não ter tido um kit alquimia quando era criança. Todo esse amor me fez escolher Química como curso na faculdade e os livros que descrevem a química no dia-a-dia são os meus favoritos, ganhando de todos os romances históricos que podem aparecer por aí. Assim, não é de surpreender que eu comprei 3 livros de química em 15 minutos quando estava na Bienal de São Paulo. 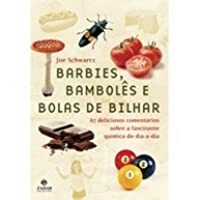 Dentre eles estava Barbies, Bambolês e Bolas de Bilhar. This book has been on my to-read list since I started keeping the current poorly-maintained version in 1999; it's designed to popularize chemistry and science for the masses, and the author, Dr. Joe Schwarcz, has apparently gone on to do about new book a year since then. I found it strange, though, that the book's introduction includes a page or two slagging the portrayal of scientists in kids' shows Bill Nye "Science Guy" and "Beakman's World." Dr. Schwarcz felt that science was interesting enou This book has been on my to-read list since I started keeping the current poorly-maintained version in 1999; it's designed to popularize chemistry and science for the masses, and the author, Dr. Joe Schwarcz, has apparently gone on to do about new book a year since then. I found it strange, though, that the book's introduction includes a page or two slagging the portrayal of scientists in kids' shows Bill Nye "Science Guy" and "Beakman's World." Dr. Schwarcz felt that science was interesting enough on its own to not need... additional excitement. The content itself is easily digestible. Each section is only a few pages, so it's a quick read. The information is geekily interesting, though the level of humor tops out at the level of bad uncle puns. Very good, but I liked "Genie in the Bottle" better. The latter had more stories about things you could relate to better. Radar was very good though, don't get me wrong. It's a great going to bed book because each section is so short. And they are very interesting so you stay awake - for a science/history book it won't put you to sleep. All the facts about food are very insightful and Dr.Schwarcz's prose is very lively. Bottom line: Read it. The first half of the book was really fascinating, but I found the second half dragged on for me. It may be because I was tired of the genre and chemistry though, not because the 2nd half was any different than the 1st half. Lots of everyday life chemistry that's good to know. "Chemical" is not a bad word. Everything in the universe is made of chemicals, even humans. "Joe Schwarcz has mastered the art of science education as an attention-holding and rewarding experience. In this book he provides a great read, a book you will not want to put down. You will learn a great deal about the world around us while being compelled to read on—it’s an educator’s dream!" Just kind of fun...pick it up anytime sort-of-thing. O Joe insiste um pouco em desmascarar mitos e lendas, deixando a química em segundo plano em alguns ensaios. Mas nada que prejudique a leitura. OBS: Li a versão em português. interesting commentary on relationships between chemistry and every day living! So far I like it! Another great book by Professor Joe Schwarcz. I really loved it. Dr. Joe Schwarcz holds a PhD in chemistry and is host of the radio program The Dr. Joe Show, directo of McGill University's Office for Science & Society and the author of fourteen bestselling books. Well known for his informative and entertaining lectures, Dr. Schwarcz has received numerous awards for teaching and deciphering science for the public.